Most obstructive sleep apnea (OSA) sufferers know that poor sleep and an expanding waistline tend to go hand in hand. Sleep Apnea can make it more difficult to maintain a healthy weight due to several factors like lower metabolism, decreased energy and unhealthy eating habits. Being at risk for obesity and OSA is such a dangerous duo. A recent study has found the connection between obesity and poor sleep, focusing on nighttime snacking. The Department of Psychiatry at the University of Arizona in Tucson conducted the study and it states that “ a lack of quality sleep leads to more cravings for late night junk food”. The research found that poor quality sleep seemed to be a major predictor of whether junk food cravings would pop up, particularly in the middle of the night. Junk Food cravings are linked to a greater likelihood of a number of health issues, including obesity, diabetes, and other heart and digestive problems. The study used data from more than 3,100 adults. It found that about 60% of the participants reported regular late night snacking. In addition, two-thirds of this group also reported a definitive lack of sleep on a regular basis. And like so many connections when it comes to sleep issues like obstructive sleep apnea and obesity, one habit tends to affect the other. For example, those that did engage in late night snacking had worse sleep, which in turn fueled them to indulge in more junk food cravings. But the good news about the connection is that just as one habit makes the other worse, fixing one problem may fix the other as well. 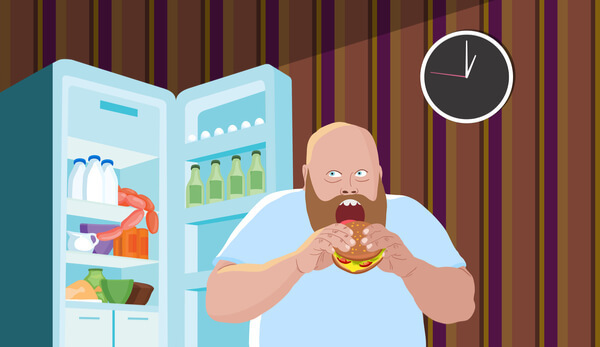 So if you have a tendency to reach for the ice cream or chips after hours, consider these little tips that will help alleviate late night cravings. Have healthy snacks on standby. One reason people reach for junk food is simply because it’s right there. Replace chips and ice cream with high protein yogurt, almonds, fruits and veggies. These foods have natural sugars and carbs, but also have plenty of fiber to make you feel full faster. Mindless snacking is also a problem. If we’re focused on the TV, the computer, or any device, we aren’t paying attention to what and how much we’re eating. When you do snack, be sure there are no distractions so you can focus on feeling full. Keep it out of the bedroom. Using your bedroom as a snacking area can cause several problems. For one thing, you can’t concentrate on sleep. And for another, you inherently link your bedroom as a place to munch. So if you need to snack, be sure to take your late-night cravings to the kitchen — preferably while sitting down at the kitchen table (no standing, or feasting in the living room). This way, you won’t feel any cravings arise due to an intrinsic association of your bedroom. A big glass of water can do a world of good when it comes to helping to alleviate cravings. Not only will it make you feel full, but it may also promote sleep when it’s time to get some restful sleep. Just be sure you don’t drink too much and too late at night, to avoid excess trips to the bathroom in the middle of the night. Sugar gives us a natural energy boost that doesn’t last long, and which leads to cravings for more – similar to an addictive drug. But by cutting down on sugar, you’ll start to notice that your cravings for sugary snacks will start to dwindle as well. An easy way to stop a craving as soon as it pops up is to brush your teeth. The minty taste and fresh feeling in your mouth will dissipate immediate cravings for a few minutes, allowing them to hopefully pass.